Property Details: Studio, 1 Bathroom Vacation Rental, sleeps up to 2. Santa Monica studio, beach resort home in Southern California. Santa Monica studio with a queen-bed, full kitchen, bathroom with stand-up shower, and french doors that open to a private patio and back yard. The kitchen is fully stocked with a microwave/convection oven, full-size refrigerator, and all the utensils that you will need. Full-size ceiling fan that is operated by a wall switch. Walk-in closet to store your bags and personal items. Enjoy dinners inside over the peninsula bar or on your private outdoor patio table. Private outdoor area includes patio and grassy area with beautiful roses. Enjoy the 40 inch HD Television with DirecTV Programming including movie channels. Strong internet signal accessible by Wi-Fi or by direct connection. Santa Monica Studio Rental in California.. The beaches of Santa Monica attract a variety of visitors to the area, from families playing on the sandy beaches to a boot-camp fitness- class. Visit the Santa Monica Pier, and the many shops, restaurants, and amusement-attractions atop a wooden wharf. For night-life, the 3rd Street Promenade is exploding with activity, from theaters to live-music venues to talented street performers. Santa Monica has three main shopping districts, Montana Avenue on the north side, the Downtown District makeup the core of Santa Monica, and Main Street on the south end - each has its own unique feel and personality. The Montana Avenue portion has luxury boutique stores, restaurants, and small offices; the Main Street area offers an eclectic mix of clothing, restaurants, and other specialty retail. 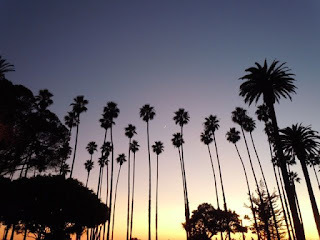 Whatever delights you, you can find it in Santa Monica California.